It is with great shock and sadness that we received the terrible news of the death of our friend and one of the key members of NACEE, Ryszard Kolman. Ryszard Kolman was born on August 11, 1947 in Olsztyn, Poland. He graduated from the Commercial Fishery Faculty of the Kaliningrad State Technical University in 1971. After graduation, he became a researcher at the Department of Fisheries Technique of the Inland Fisheries Institute in Olsztyn. At that time, his main interest was in the field of the artificially reproduction of coregonids. He obtained his PhD in fisheries from the Inland Fisheries Institute in Olsztyn in 1981. In 1983, he transferred to the Experimental Field Station „Dgał” in Pieczarki of the Inland Fisheries Institute as a Head of this station. He returned to the Olsztyn in 1989, and worked in Department of Lake Fisheries. He defended his habilitation in 1993, and received the title of Professor in 2000. After habilitation his attention turned to sturgeon – long-lived and late-maturing fishes. Professor Kolman contributed significantly to the conservation, and recovery of Atlantic sturgeon. 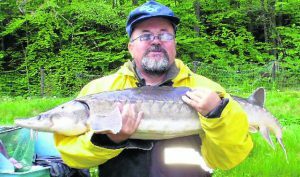 He is considered one of the founding fathers of sturgeon breeding in Poland. He has led and collaborated on numerous sturgeon research endeavors and played an invaluable role in breeding efforts for the species. Profesor Kolman was the author of many outstanding scientific publications. His research has been published in Aquaculture, Aquaculture Research, Comparative Biochemistry and Physiology, Environmental Biology of Fishes, Fish Physiology and Biochemistry, Journal of Applied Genetics, Journal of Applied Ichthyology, Journal of Ichthyology, and many others. As a scientist Ryszard Kolman was active to the end of his life. A few weeks before his death, Ryszard Kolman worked on a new article on sturgeon remediation in Poland. He organized and chaired numerous meetings and conferences. He was one of the most active members of the Network of Aquaculture Centres in Central and Eastern Europe (NACEE). Professor Kolman was member and important advisor for Sturgeon Culture Group. He was also active member of the Polish-Russian commission for Fisheries Management. Professor Ryszard Kolman was a member of the Scientific Council of the Inland Fisheries Institute in Olsztyn from 1993 to 2018, and the Head of this Council from 2015 to 2017. For many years he was the Head of the Department of the Ichthyology in Inland Fisheries Institute in Olsztyn. His achievements have brought him numerous honours and awards: the team and individual awards from Ministry of Agriculture and Rural Development, the Bronze and Silver Cross of Achievement by the Polish Government, and the Golden Badge “Meritorious for Agriculture”. Professor Ryszard Kolman taught and inspired many young people with his profound knowledge, and warm personality. Most importantly he was a great friend to our whole team. We are forever grateful for his contributions. Our thoughts and sympathies are with his family during this difficult time. We offer sincerely thank him for his achievements in research and education. Ryszard Kolman is survived by his wife, his three children and four grandchildren. We thank Prof.Andrzej Kapusta from Inland Fisheries Institute in Olsztyn, Poland, for his help in this obituary.